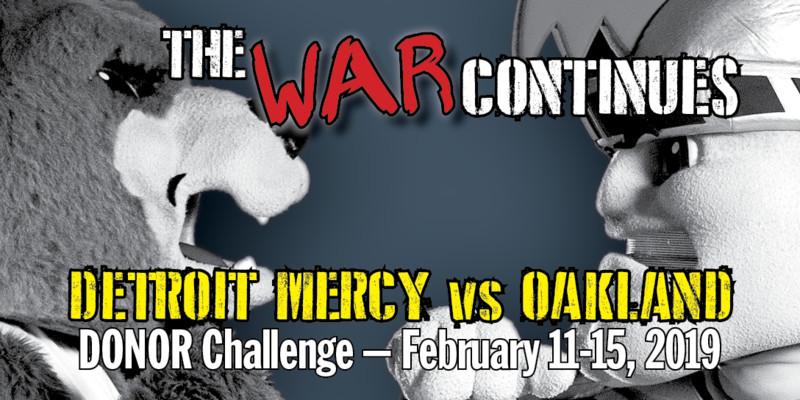 University of Detroit Mercy will once again face off against Oakland University for the Detroit Mercy vs. OU Donor Challenge, which started today and runs through 5 p.m. Friday, Feb. 15. The winner is determined based on the number of donors during the competition timeline and will be announced during the Detroit Mercy/Oakland University men’s basketball game on Saturday, Feb. 23. The losing school’s mascot must wear the winning team’s mascot at the game. Detroit Mercy won the first and third challenge in 2016 and 2018 and OU came out on top on the final day to win in 2017. That’s why this year’s theme is “The War Continues.” Detroit Mercy is running several crowdfunding campaigns and a special Day of Giving in conjunction with the challenge, so donors can direct their gifts to projects or programs that are most meaningful to them. “Given the enthusiastic support of Detroit Mercy’s alumni, paired with student, faculty and staff participation, we expect that Tommy Titan will not have to wear the OU jersey again,” said Judy Wernette, Director of Annual Giving at Detroit Mercy. To learn more about the Detroit Mercy vs. OU Donor Challenge, please visit community.udmercy.edu/dontwearthebear and watch a video about this initiative. You can also make your donation directly at community.udmercy.edu/donate starting Monday, Feb. 11. For additional information, please call 313-993-1250.